The dictionary went on to differentiate the word to mean fish, birds, water depths and even sediment that is oceanic, thus making the term widely interpreted. It could be the beginning of a Peter Benchley novel, with a massive swift monster emerging from the cold, dark pelagic brine. 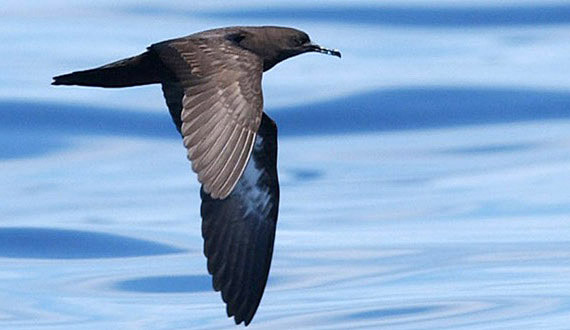 This post, however, will explore the word pelagic and its connection with birds. When birders think of ‘seabirds,’ we sometimes imagine a lone, long-winged bird soaring over endless waves. Lifted by wind currents, they float above the ocean white caps just off shore. While that romantic image may be accurate for some seabirds (like brown pelicans), there are many other birds that follow the marine life far away from the sandy beaches and populated coast lines of the earth. They are “deep” at sea. Thinking back on Coleridge’s Rime of the Ancient Mariner, the albatross comes to mind. A dead albatross is hung around the mariner’s neck as a curse for killing the bird with a crossbow. The old-salt mariner wanders the world’s ports to retell his story in near-endless verse. Albatrosses are part of a large collection of birds who live most of their lives at sea. They are known as pelagic birds. Unlike many marine birds, albatrosses also walk well on land. Just looking at albatrosses around the globe, there are 22 different species. They are part of the Diomedeidae bird family. Other families of pelagics include auks, boobies, frigatebirds, skuas, petrels, fulmars, gannets, murres, penguins, puffins, guillemots, shearwaters, tropicbirds, and more. Pelagics are among the largest flying birds in the world, with mammoth wingspans and narrow wings that give them superb lift for easy flight. Some authorities include cormorants in this list of pelagics, but there seems to be wide inclusion, depending on the sources. With their compact bodies pelagics are well adapted to northern seas and colder waters. Auks typically have upright posture on land but can be clumsy when walking. Most have black and white plumage, and many also have colorful bills or distinct markings. Auks are part of the Alcidae bird family. Boobies are named for their somewhat stupid expressions and history of gullible behavior (pun intended) where hungry sailors are concerned. These are beautiful tropical gannets with bright bills and feet, including the familiar and celebrated blue-footed booby. These are larger, heavy birds that can seem awkward in flight, but are often seen perched on buoys, cliffs or rocks. All boobies are part of the Sulidae family. Also called the pirate bird or man-of-war bird, frigatebirds are stately fliers with long, hooked bills, sharply pointed wings and boldly forked tails. We spotted them high in the air above Hamilton, Bermuda, on our honeymoon. The distinctive red gular sac of the males is visible with the naked eye, even when the bird is in it’s high, soaring flight. These are large birds that may circle slowly and elegantly before diving to steal fish from other birds. All five frigatebird species belong to the Fregatidae bird family. 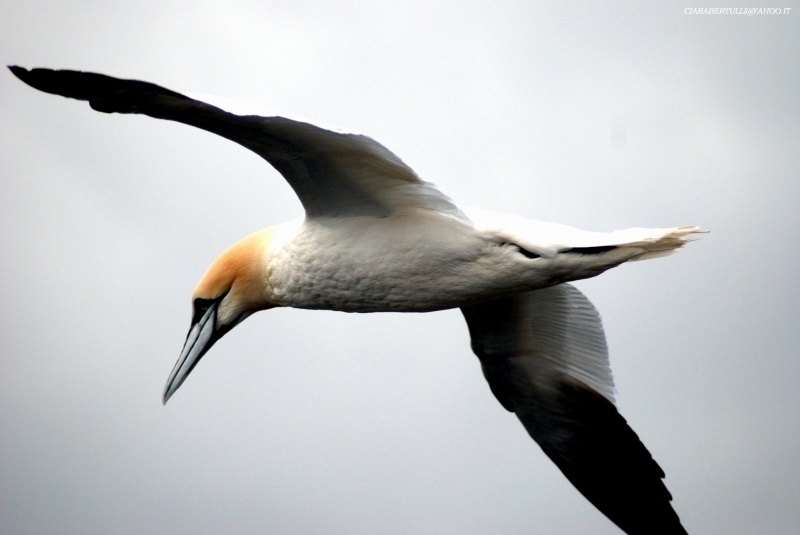 Gannets are large, chunky birds that appear somewhat ungainly on land, but they are strong fliers and powerful diving fishers. Their white plumage, buff-tinged head and black wingtips are distinctive for the three gannet species: northern gannet, cape gannet and Australasian gannet. Because of those similarities, range is critical to tell the species apart. All three gannets are part of the Sulidae family along with their close relatives, the boobies. Common guillemots are related to Auks, one guillemot comes in bridled form (with spectacles) and one in the white-marked bills from the Uria genus. And the black guillemot from the genus Cepphus. The word guillemot comes from the French word for the name William or Guillome. 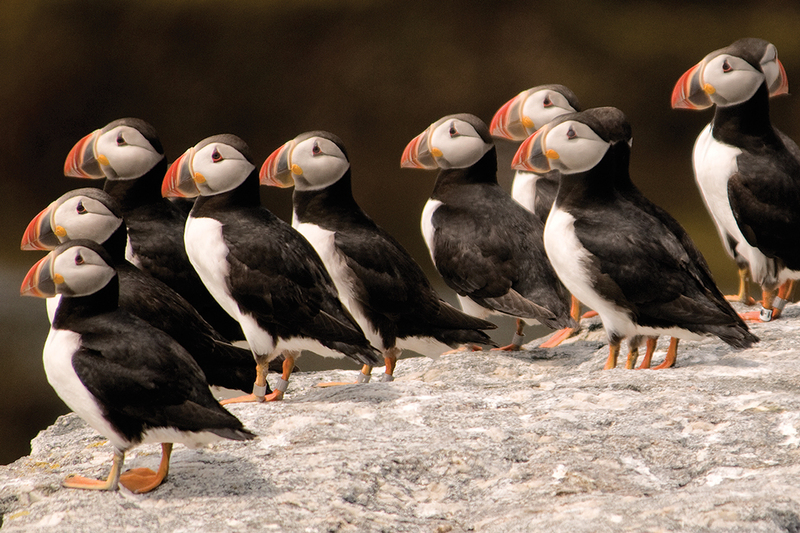 These birds are common to the Oregon Coast, nesting on Haystack Rock with the puffins and murres. A type of auk that resembles penguins, murres have dark and light counter-shaded plumage and will swim underwater in pursuit of fish. When on land, they have an upright posture and waddling gait. There are only two murre species, the common murre and the thick-billed murre, both of which are found in northern oceans. These species are part of the Alcidae bird family with other types of auks, including puffins and guillemots. Flightless birds of the southern oceans, penguins are specialized seabirds well equipped for frigid waters with insulating plumage and fat. They are stunning swimmers and have specialized flipper, rather than feathered wings. 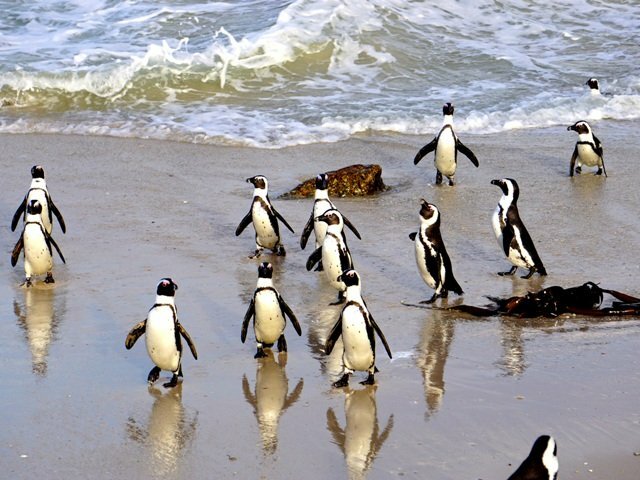 Despite their chilly reputation of loving Antartica, however, several penguin species actually breed in tropical regions. The 18 different penguin species vary greatly in size and range, though several types of penguins are physically similar. All penguins are in the Spheniscidae bird family. Petrels are small seabirds are distinguished by their elongated, tubular nostrils and their low, wave-skimming flight. They often stay so close to the water that they have the appearance of walking on its surface. Like many seabirds, petrels stay at sea nearly all their lives, returning to land only to breed. Birds called “petrels” are found in several scientific families. While some classifications are not universally accepted, the true petrels are generally considered part of the Procell family. Puffins are large auks with broad, colorful bills and whimsical expressions. Because of this, they are often called sea clowns or sea parrots. They are powerful swimmers and nest in large colonies, where the breed in secluded nests, protecting the colony from predators. Typically these colonies are on offshore islands or isolated northern coasts, such as Haystack Rock on the Oregon Coast. On land, they have an upright posture, and in flight their wing beats are rapid and their path direct. There are only three puffin species – horned, Atlantic and tufted – all in the Alcidae family. Shearwaters are small petrels with long wings that specialize in low, gliding flight. Their wingtips may brush the waves and “shear the water” as they fly, giving these birds their familiar name. There are more than 30 shearwater species and these birds can be found worldwide, but they often remain far out to sea. Where feeding conditions are ideal, like puffins, they can gather in large groups, especially where upwellings bring prey – fish, plankton, squid, etc. – close to the surface. 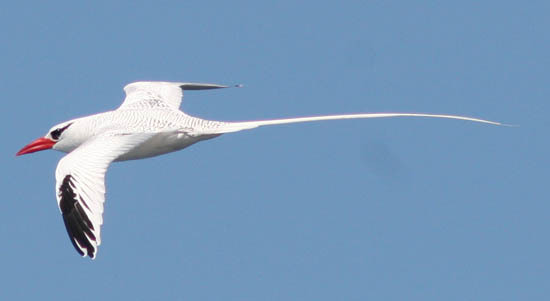 Unlike many seabirds, tropicbirds have primarily white feathers. Their distinctive plumage is easily identified by their very long streaming tail feathers. They have short legs and are shallow plunge divers when they hunt. There are only three species of tropicbird – the red-billed tropicbird, the white-tailed tropicbird and the red-tailed tropicbird. They are magnificent fliers, as a long tail has its acrobatic advantages. They are very distinct, and the only members of the Phaethontidae family.